lazy sunday makes for lazy thoughts. alternating a good movie and wildlife (sort of) going on outside my window makes for fantastic relaxation. from nowhere bird flies into the tree. it is black. its tail is white and long. i'm calling my bird topbird, since it balances exotically on the top branch of this enormous douglas tree outside my skylight window. i have my camera on the stand, and lazily shoot a memory. while i do so, i imagine BIRD to be an interesting drawing theme. I love your drawings (as always). The lines and colours. The mirror effect. And coincidences are exciting. My post will be ready later today. I'm on my way out to see the spring sun first. mine is a pigeon too! love your shell header! and i was wondering about watching that movie just the other day... glad to know it was good. How can you change your banners so frequently? I've had the same one for two years ... I forgot how I did it! Oh, yes, I like the effect of mirror very much, dear Nadine. 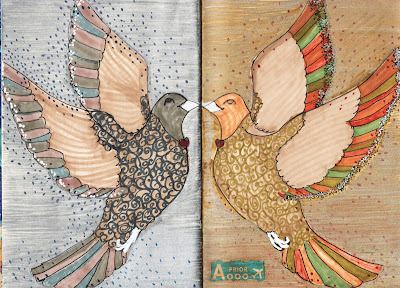 Birds of peace... we need them. Ahaaa, so Coco Chanel and Stravinsky were together once? ?...hmm I didn't know that. I'd have to watch that film too. there's no way we want you to do that. I find very attracting this drawing challenge, I think I'll try it when I find some time (I've always been a keen drawer about anything but specially animals and dresses). Big kisses, i love watching my mail with your messages! Love your birds and the view from your window. what a perfect and beautiful dedication to the people of Japan. I wonder if they sense all of the peaceful and healing wishes that are flowing their way right this minute? beautiful! your birds conjure up a feeling of strength and miracle...like a phoenix rising. i love the mirroring. really nice! i posted mine finally if you'd like to visit. pretty birds, I like their swirly bellies. 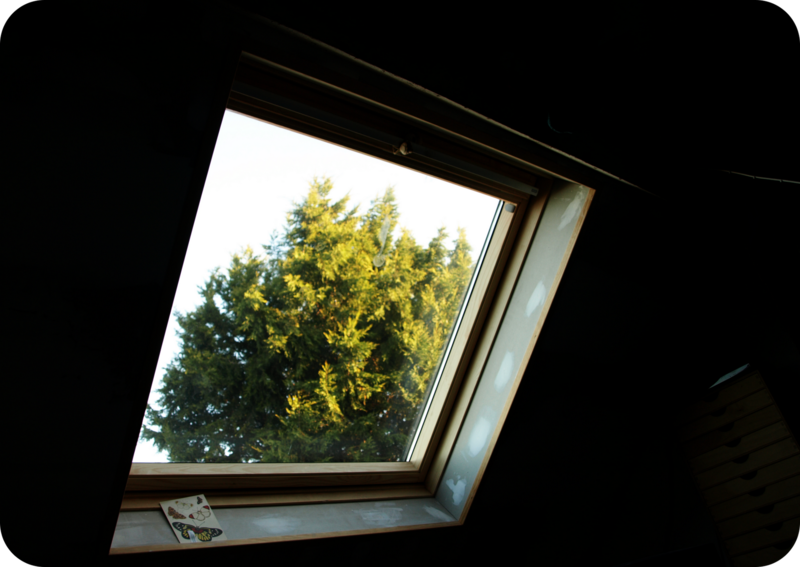 So jealous of your skylight window. I loved this word so much this week.